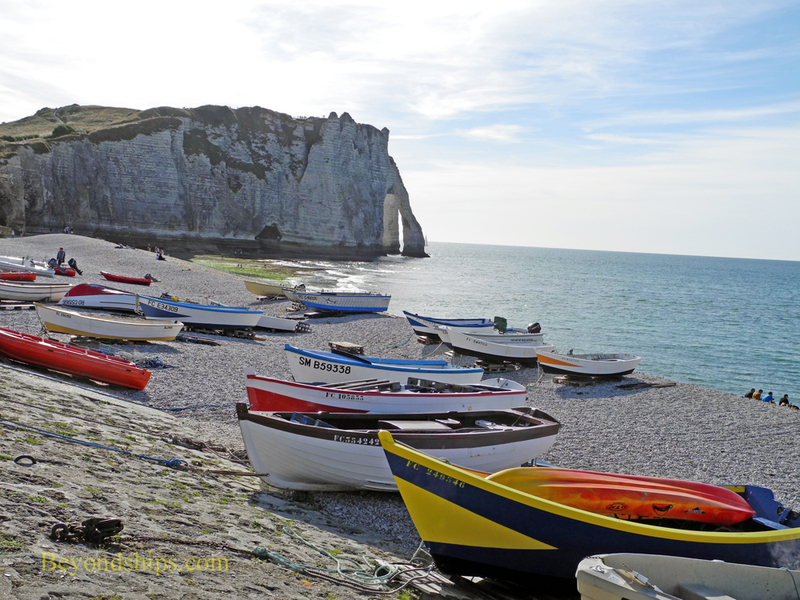 The resort town of Etretat is the site of the most famous cliff formations on the French Coast. They have been painted by a host of artists including Delacroix, Boudin and Courbet. However, the artist most closely associated with these spectacular cliffs is the leader of the Impressionist movement, Claude Monet. 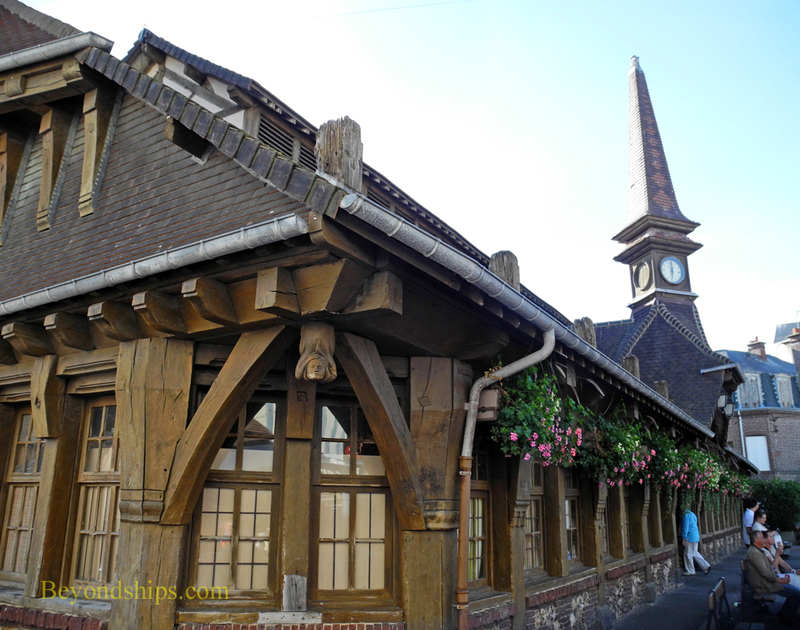 A visit to Etretat allows you to stand where Monet stood when he painted his masterpieces. 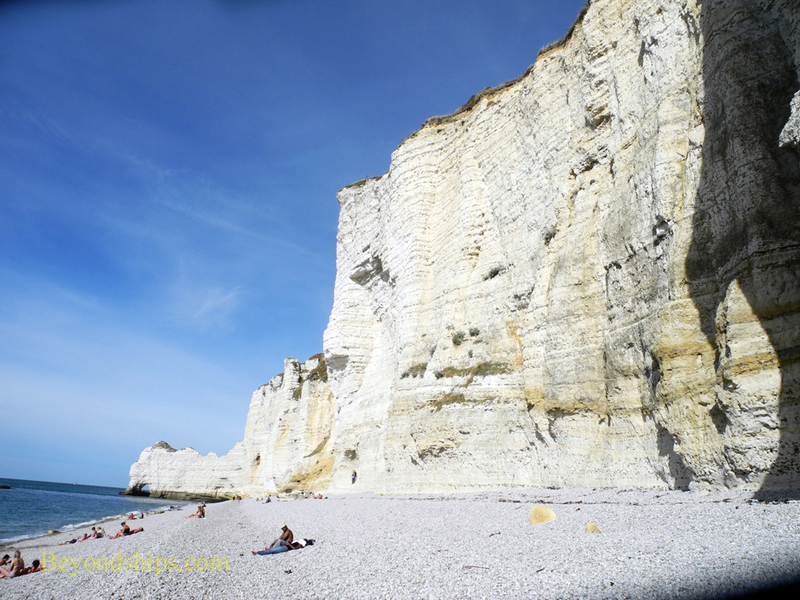 You can walk along the beach and marvel at the towering cliffs. And you can climb to the top of the cliffs for a panoramic view. The town sits in a valley between two cliff formations. 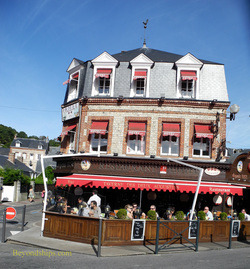 It is picturesque, if somewhat touristy, with old buildings, sidewalk cafes, restaurants and a casino. In addition to the artists mentioned earlier, the writers Victor Hugo, Alexandre Dumas, Samuel Beckett and Guy de Maupassent lived here. At either end of the beach are cliff formations that jut out into the sea. Each is punctuated with a natural archway, worn through by the pounding of the sea. 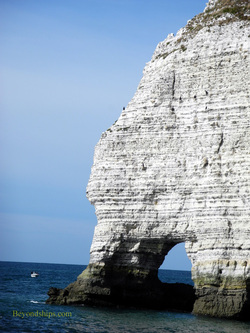 The arch and needle rock at the southern end is called La Porte d'Aval. In the photo above left, a sign has been posted showing where Monet stood to paint one of his pictures of this formation. It would not be possible to post such signs each place Monet stood as he painted numerous painting of this subject. In fact, in 1885 alone, he did 40 paintings of Etretat. 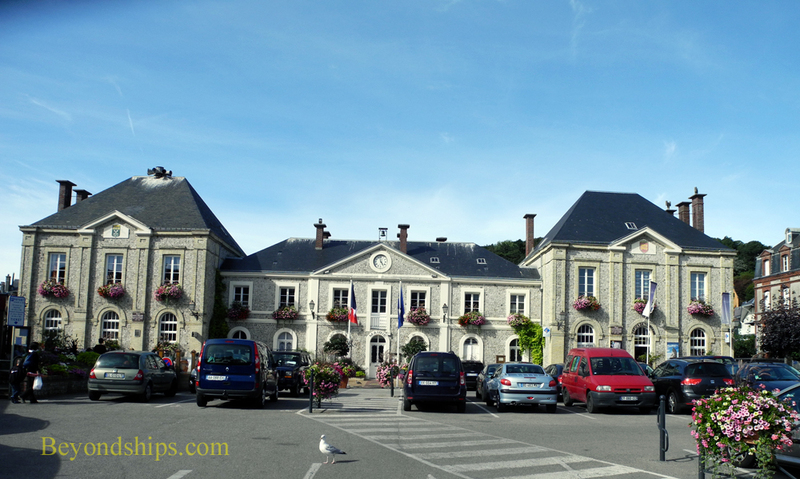 At the opposite end of the beach is Porte d'Amont, which is also the subject of several Monet paintings. 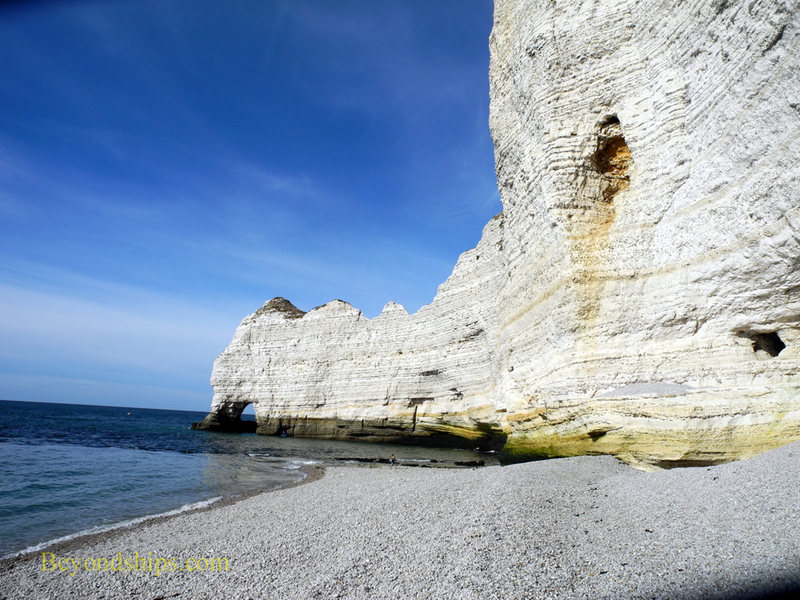 The towering chalk cliffs have been carved by the sea and the wind. Walking beneath them can be awe-inspiring. Still, for most tourists, it is just a pleasant spot to lie by the sea, fish or chat with friends. 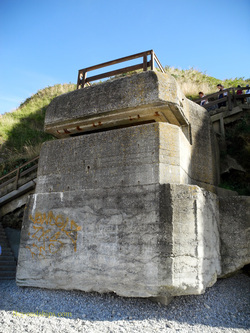 Left: A German bunker from World War II is a reminder of more somber times. 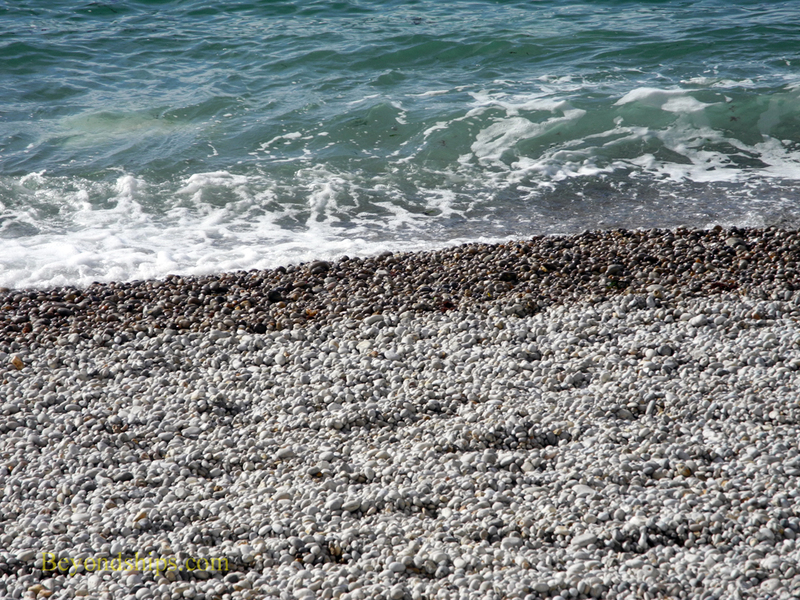 Right: The beach is made up of small stones, which make a crunching sound as you walk along.